Remember to come by the Barn Nursery to donate frozen turkeys, hams and non-perishable foods tomorrow, November 25, from 7am-6:30pm. Come by at lunch and enjoy a free fried turkey sandwich! The UTC intramural flag football event has been delayed due to rain. All details are the same as listed below, except the date is now next Monday, December 1. We were serving our last meal of the day. One of the people eating with us came up and asked a lot of questions about our services and exactly what we do here. Our food services assistant, Greg answered his questions and talked with him for a while. The gentleman was not a regular. Greg had not seen him before. After he finished eating, he went to the front desk and asked if this was where he was to pay for his meal. We told him that it was not necessary for him to pay. That our meals are part of our ministry to the homeless and needy of Chattanooga. He thanked us and turned to leave. Monday, November 24 - 2 UTC events to benefit the Community Kitchen. November 24th is a busy day at UTC. Students and Faculty are sponsoring two events to benefit the Community Kitchen. 1.) Beat Hunger, 7:30pm, Roland Hayes auditorium, annual percussion showcase concert to benefit the Kitchen; for over ten years, Dr. Monte Coulter has been organizing this lively event - bring a $2 check or 2 non-perishable food items to get in the door! Come early if you'd like a seat! 2.) 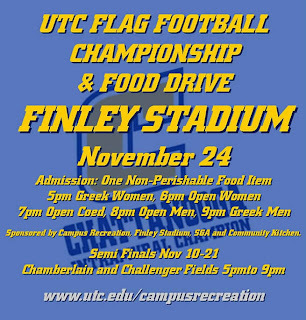 Flag Football Championship, 5pm-9pm, Chamberlain and Challenger Fields, sponsored by the UTC Campus Recreation, Finley Stadium, UTC SGA and the Community Kitchen. Admission is one non-perishable food item. For more details, click on the photo below or click here. And, if you've still got energy, get up the next day (November 25) and play Sodoku at the Pi Mu Epsilon Sodoku tournament; 11:00 AM room 422 of the EMCS building. UTC math students are offering a Sodoku tournament to benefit the Kitchen. No registration needed; show up with $10 entry fee and become the Sodoku Shogun (winner receives 20% of total tournament proceeds; 80% goes to the Community Kitchen). Our newsletter is out! 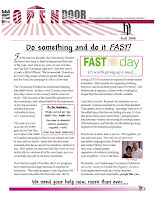 Click here to view the Fall 2008 (November) newsletter! Evensong to Remember the homeless who have died. On Sunday, November 2nd, 2008, All Saint's Sunday, Saint Paul's Episcopal Church held an evensong service to remember the homeless who have died. Each year we solemnly honor those we have served that have died. Many have died homeless, some have died of homelessness; others, once homeless, had moved on to housing. All are worth remembering and honoring. Each is a life lost. This year, we remembered the following friends: William “Billy” Thomas; Kevin Beene; Donald Ray Edgemon, Jr.; Wanda Bulloch; George Anthony “Elmo” Monds; Beverly Johnson; Huey Glen Farmer; Sharon Goins; Philip Redmon; Richard Heath; Judy Bradford; Robert Turner; Edward Brandenburg; Debra Rowe; Jacqueline Gaines; Ellis Orr; LaTony Johnson; Lori; Terry Lewis; Mary Beverly Henderson; Michael Stewart; Robbie Taylor; John Henry; Sophia DeBord (child); Dana Glaze; Woody; and Those Unknown and Unnamed by us. How do we measure a life? By the counting of its days? By accomplishments or by the wealth accumulated? This evening, we remember the homeless who have died this year. These were the people who lived on our streets, in our missions, in the hidden, secret places, out of sight and all too often, out of mind. Perhaps we passed them on the street and prayed that our eyes did not meet. Perhaps we helped them in some small way and felt better about our own lives. “Let us now praise famous men, and our fathers that begat us. And were the glory of their times. And their children after them. Whose righteousness hath not been forgotten. For many of us, these names we read here tonight are deeply etched on our hearts. These were our friends, our companions in the cold, our family. These people lived in the struggle and in the humility of poverty. But, I will remember the laughter, the amazing generosity and the grace that so many of them brought into our lives – Judy Bradford’s smile, Huey Farmer’s voice, Robbie Taylor’s earnest optimism and Edward Brandenburg’s sweet gentle spirit. These people offered us so much love and goodness. “We learn, at the last, to look at our brothers as aliens, men with whom we share a city, but not a community. Our lives on this planet are too short and the work to be done too great to let this spirit flourish any longer in our land. But, perhaps we can remember –even if only for a time- that those who live with us are our brothers and sisters, that they share with us the same short movement of life, that they seek- as we do-nothing but the chance to live out their lives in purpose and happiness, winning what satisfaction and fulfillment they can. Surely this bond of faith, this bond of common goal, can begin to teach us something. Surely we can learn, at least, to look at those around us as fellow men and surely we can begin to work a little harder to bind up the wounds among us and to become in our hearts, brothers, sisters and countrymen once again.” Amen. Thanks for visiting our blog. Be sure to visit our website too!